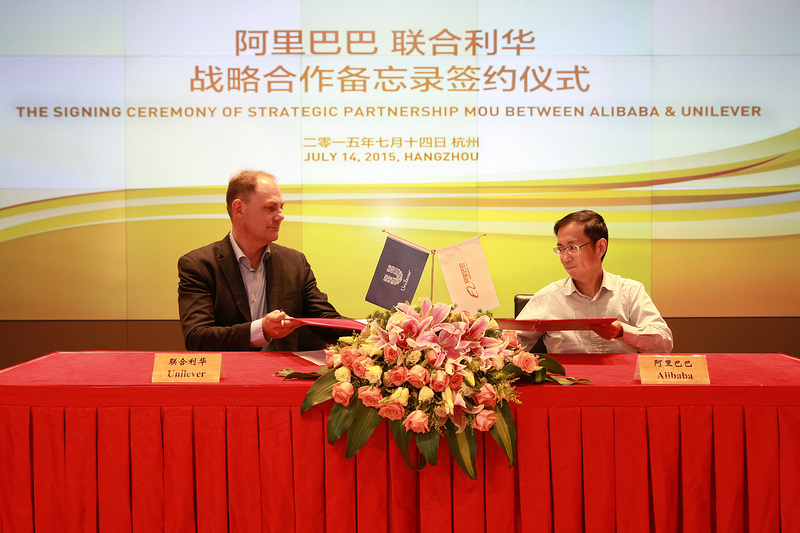 Hangzhou, China, July 20, 2015 – Alibaba Group and Unilever China announced today a comprehensive strategic partnership that will enable Unilever to reach customers across China with unprecedented precision and effectiveness through Alibaba Group's data-driven ecosystem. Key areas of collaboration include rural China penetration, cross-border e-commerce, consumer protection and Big Data. "We are very pleased to amplify our partnership with an industry leader such as Unilever," said Daniel Zhang, Chief Executive Officer of Alibaba Group. "We look forward to building on our success in sales over the years and taking the collaboration to the next level. Moving forward, Alibaba Group and Unilever will jointly innovate in Big Data analytics application, cross-border e-commerce, and supply chain management. In this rapidly changing business landscape, we are committed to continually provide greater value to merchants and better experiences to shoppers." "Alibaba has changed the shopping habit of Chinese consumers. Its mission is to make it easy to do business everywhere, and its vision is to build the future infrastructure of commerce. This meets the Unilever's development needs in China," said Marijn Van Tiggelen, Unilever North Asia President. "Alibaba is the leading internet company in China, with the most innovative thinking. It's not only an online store, but also a solution platform for online payment, e-finance, and e-commerce logistics. In cooperation with Alibaba, Unilever can provide more convenient services to consumers in China." Deepen collaboration in Alibaba's Blue Star program where each product is tagged with a unique QR code that allows the consumer to verify its authenticity and origin. This will help protect Unilever's brand and combat counterfeit goods to protect the customer user experience. The upcoming Unilever Week on Tmall.com, scheduled for July 22 to 24, will celebrate the start of this partnership agreement. Unilever China opened its first Tmall.com flagship store in June 2011 and, most recently, a Tmall Global flagship in September 2014, leveraging the free trade zone and bonded warehouse model. Unilever is one of the world's leading suppliers of Food, Home and Personal Care products with sales in over 190 countries and reaching 2 billion consumers on any given day. It has 174,000 employees and generated annual sales of €48.4 billion in 2014. Over half of the company's footprint is in the faster growing developing and emerging markets (57% in 2014). Their portfolio includes Persil, Dove, Knorr, Domestos, Hellmann's, Lipton, Wall's ice cream, Marmite, Magnum and Lynx. Supporting these goals, the company has defined nine commitments, underpinned by targets encompassing social, environmental and economic areas. For more information about the Unilever Sustainable Living Plan at www.unilever.com/sustainable-living/. Unilever was ranked number one in their sector in the 2014 Dow Jones Sustainability Index. In the FTSE4Good Index Series, they attained a top environmental score of 5, leading to inclusion in the FTSE4Good Environmental Leaders Europe 40 Index. In 2014 they led the list of Global Corporate Sustainability Leaders in the GlobeScan/SustainAbility annual survey - for the fourth year running. In 2014 Unilever was named in LinkedIn's Top 3 most sought-after employers across all sectors and is also LinkedIn's No. 1 most sought-after FMCG employer worldwide. For more information about Unilever and its brands, please visit www.unilever.com.